Have returned from a non credit easy method writing course. One of the things that the teacher recommended was getting a writers cup. When ever you use that cup you write. So went a and got a cup as seen below. This is the first drink and first write from the cup. The teacher said that she did not believe in writers block. Oh yea will how do explain what has been wrong with me for so long. Well she would probably say that I have to scheduled it in. She said that a plumber doesn’t say, “I have plumbers block.” That is funny, a blocked plumber? One of my issues is that I have many interest and perhaps a little ADHD. I tend to jump from thing to thing. If I get stuck I switch things. Unless of course I am doing something for someone else, i.e., an employer. In that case I may stay up until we hours of the night just to get the job done for them. For some reason I often lack that dedication for myself. Fear? Perhaps. Fear of failure. Fear of success. I have many stories in me. Often I can go off on long story telling jags, on a story drawn from my 22 months aboard fishing boats in the Bearing Sea and the Sea of Okhotsk. Of course I am afraid to blog about it, because someone could take it as their own. Once a guy I worked with started using funny fishing boat stories of mine for his comedy routine. Whoa there nelly, that is not okay. Then again when I tell people the stories they get a lot of joy out of them. Perhaps I should throw caution to the wind. Perhaps I could write about something else. Writers block. Well that has been my excuse for giving up on writing for magazines. When I graduated from college, close to 20 years ago, I worked as a investigative writer/photographer for a weekly montana paper, for $.50 a column inch and $3-$4 for photos. It was a 3 month trial and they didn’t hire me on. The editor said that I would be a great magazine article editorial writer. So I never did do that. I have written a couple of small college paper articles and did go on to write a fair amount of poems. However, it seems that writing has faded. Well until now this is the beginning of the new chapter. Well, 15 minutes a day will get you a manuscript, a first draft of a manuscript of a novel, anyway; not a finished novel. Still, I have to agree w/the advice to schedule it in. If a cup helps make that happen, terrific. If not, not something which does. We humans never run out of ways to reward ourselves! Good luck. Writers write, painters paint, runners run, gardeners garden….so based on that, what are you? 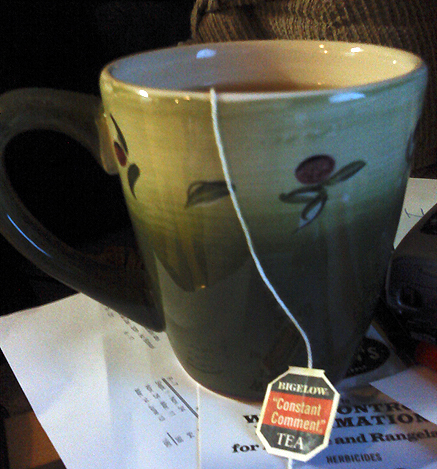 “Constant Comment” the tea that was named for Navar.